Many people are new to contact lenses and have practical questions about contacts such as how to put them on and how to get over the fear of wearing them. If you just got a new prescription for contacts, these tips can help you deal with everyday concerns. 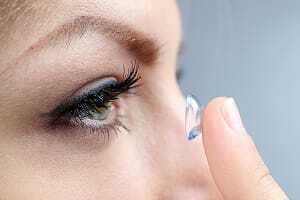 Contact lenses have been a lot more simple to use in place of glasses. Eye glasses tend to be very difficult to keep in mint condition. Contacts, on the contrary, don’t scratch or fall out very easily. Most importantly, if you are the kind of person who cares about physical appearance, then contacts look as if they aren’t even present. Practice dabbing your finger, gently, on your eye to get used to the feeling. Once you have the gist of how the finger feels inside the eye, you can move on to actually trying to apply contacts. This takes a few days of practice and it is absolutely vital that you keep your hands sanitized and clean prior to touching your eyes. Another great tactic is to avoid looking straight at the finger coming in contact with your eye. That way, you aren’t intimidated by it. After getting accommodated with the idea of contact lenses, it may be in your best interest to contact your eye doctor for suggestions. Once you have the lenses, keeping them in healthy condition is crucial in order to prevent infections or bacteria build-up. Using only contact lens cleaning solution after every use, you can keep your contacts clean and safe for future use. While you are using contact lenses, be careful not to rub your eyes or scratch them, as it can not only damage the lenses, but your eyes as well. If your contacts were to be dropped, make sure that they do not come in contact with your eyes unless they have been disinfected with contact lens cleaning solution. When not in use, keep them in a sanitized contact lens case, and never leave them laying around. For more information about contacts or to schedule an eye exam, call 602-242-6888 or visit our website.